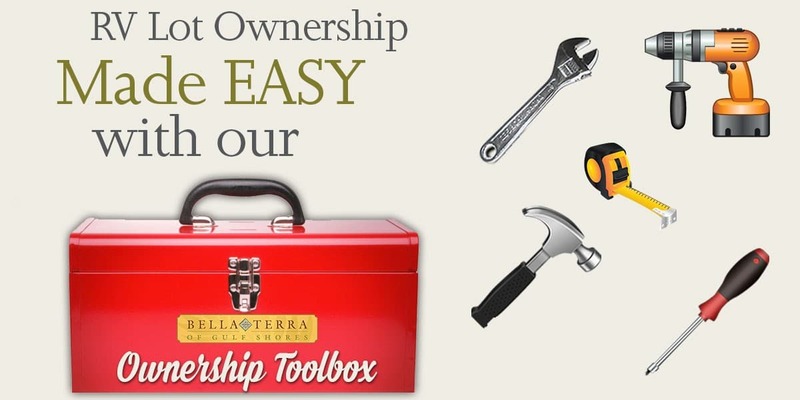 Bella Terra’s Ownership Toolbox Has the Perfect Solution for You. What is perfect for one person might not be for another. Therefore, we at Bella Terra RV Resort of Gulf Shores have designed an Ownership Toolbox to help you customize your Bella Terra RV lot purchase experience by allowing you to move our marketing dollars from what you don’t need/want to what you do. Perhaps you are selling a piece of real estate or waiting for another financial transaction to close in a short period. A Customized 0% Interest Loan might be what you need. Call us, and let us explain how 0% Interest works. Logically, many retirees have assets but might have limited or no earned income. The answer might be our No Income Verification Loan. Because banks loan on income, and not assets, retirees are sometimes turned down simply because of limited or no earned income. We know Class A RV owners and, more specifically, baby boomers in their pre- and post-retirement years. In fact, we are both Class A owners and boomers. Let us custom design a loan that will work for you. Who needs to beg a banker for a loan when Bella Terra already has you covered? Perhaps you have a Limited Down Payment, but you expect more in a year or two. Our No-Penalty, Drop-In Mortgage Option might be what you need. Call us, and let us explain. You’ll be glad you did. Perhaps you are paying cash for your lot but want to shift all our marketing dollars to a larger custom build-out. Let us build, at no charge, a custom gazebo, pergola, or outdoor kitchen on your new lot. In fact, we will custom design, at no cost to you, all the amenities you want now and design your lot for those you might want in the future so you can have in your hands a site drawing of everything you could ever want on your lot. Perhaps you have assets in your brokerage account that you do not want to sell. We can show you an option that allows you to borrow against your assets without selling them, with interest rates between 2% and 4%. This is more than a margin account; this positive change is one of the few that came from the Financial Regulations post-2008 Financial Implosion. Best of all, this entire loan can be structured to be self-liquidating through dividends and/or capital gains. Let us explain the power of this simple option. Perhaps you are retiring in the next two to five years. Our Low-Interest Balloon Loan might be just the ticket to buy now—enjoy your RV Beach Home between now and retirement and pay the balance of the lot when you have access to your retirement funds. You get the idea. With our Ownership Toolbox, we can custom design your RV Beach Home purchase with the payment, interest rate, type of loan, and upgrades that are right for you and you alone. Give us a call at (866) 417-2416, complete the contact form on this page or email [email protected] for more information. Would you like to receive the Bella Terra of Gulf Shores email newsletter?